As Batman has his Joker, as Superman has his Lex Luthor ... so too does the Fantastic Four have their archvillain, Doctor Doom. Arguably one of the most recognizable menaces of the Marvel Universe, and pointed to by many as the visual inspiration for one of the other great villains of the 20th century, Darth Vader, the creation of such a hit - only five issues in - has to be seen as another major milestone in Stan Lee & Jack Kirby's continuing efforts. Of course, as we're seeing quite a bit in these early issues, this initial conception is still a ways off from the Victor Von Doom readers would come to relish. His costume is a bit off in this first appearance - full-length sleeves, and a medieval-tunic cut - though this would be corrected to his permanent look by his very next appearance. When he kidnaps the FF, he takes them to his castle - but as nothing indicates that he's dragged them to a small, Eastern European country, we're left to believe there's a large booby-trapped castle in upstate New York. Finally, when we first see him the comic plays up the "dark magic" angle - he's surrounded by books that say things like DEMONS, or SCIENCE AND SORCERY - but his time machine was scientifically invented, the captured Doom at issue's end is actually shown to be his first Doombot, and every threat in his stronghold is of a mechanical nature. And it must be said: Like the schemes of so many over-the-top bad guys, Doom's master plan is a bit ... insane. 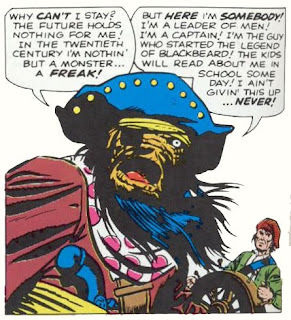 Doom decides he wants the gems once owned by Blackbeard the Pirate, said to have mystical properties - so he sends the FF (minus hostage Sue Storm) back in time to fetch them. Because they'll clearly just do that. And when they get back, with Blackbeard's treasure chest filled not with jewels, but iron chains - seriously, this was their plan? - they only get away because Sue turns invisible and manages to hit the cut-off switch on Doom's machine. Which then blows up in his face. Maybe next time he'll contract for union labor? Great blog! Keep up the good work. I got into Marvel about the same time as you and always loved the '60s reprints in Marvel Tales, etc. Thanks, Jon! Yes, between monthly reprint comics, and things like MARVEL SAGA, it was easy for a reader in the '80s to learn the broad strokes of where their comic heroes had come from. A shame that such a thing doesn't exist anymore ... perhaps they think with the existence of Wikipedia it's no longer as needed? You're right. Some of this is pretty dumb. But ya gotta love that Joe Sinnott inking. John Byrne has said in interviews over the years that this was his first FF issue. He has also mentioned that his last issue was #32 right before he gave up comics altogether. Nine years later, his first FF issue was, get this, #132. Interesting coincidence that it took him 100 issues to pick up another FF issue. The castle that Doom resides in is located in the Adirondack Mountains, as revealed in UNCANNY X-MEN #145 (May 1981). 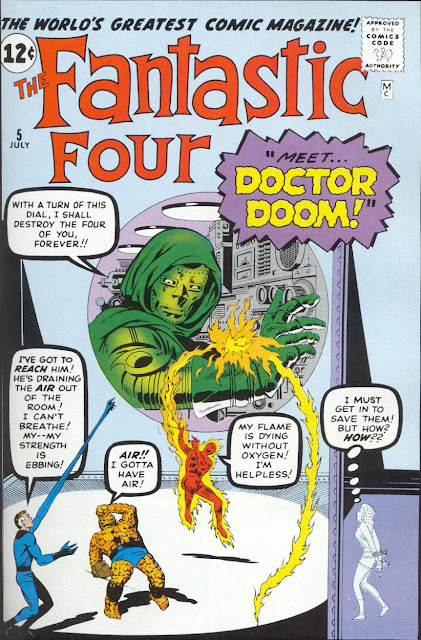 Dr. Doom's time-travel machine makes its first appearance in this story and the rectangular platform that is a part of the device is known as a Chrono-Square, as revealed in the Dr. Doom story in MARVEL SUPER HEROES #20 (May 1969). 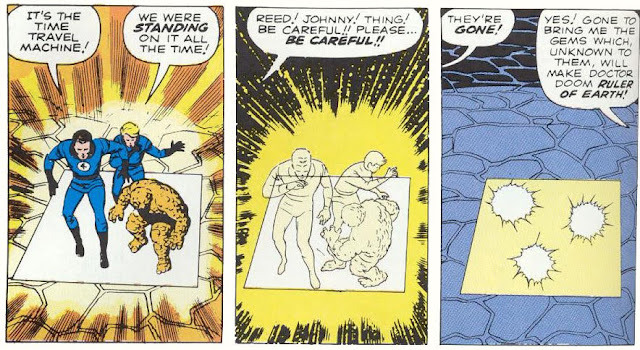 A duplicate of the time-travel machine built by Reed is used for the first time in issue #152. Future FF writer Roy Thomas becomes the 2nd fan turned pro to have a letter featured in the FF letters page. The first was future comic book artist, Alan Weiss, in issue #3. I was worried with this issue in how the writers would deal with time-travelling, and I must say they quite succeed by not making it a complete mess. However, when we look at future X-men storylines, which feature time travelling, and time machines as inventions of the future, Doom's machine seems a little bit ahead of its time. CrashOverride is a dangerous malware that can be used by hackers to steal confidential details. So, visiting the link to get detailed information on CrashOverride removal from your Windows computer. Presence of Any Search Manager or other malware on your computer can be dangerous because they can cause a lot of damage. But here you will get help to remove this threat and all the suspicious program from your PC. Know how to delete search manager from system as it is a deadly computer malware that harms your system and steal confidential information. If Your system has been infected with virus and unable to access the files, then visit the Websites which are given below. It will provide simple instruction to detect the virusfrom your System and protect it from future troubles. If you have lost your memorable Photos from FUJIFILM X-A10 Digital Camera by some incident. You are unable to restore it then use Photo Recovery software to recover your all lost, corrupted or damaged files in just few clicks. So, Download the software for better experience. 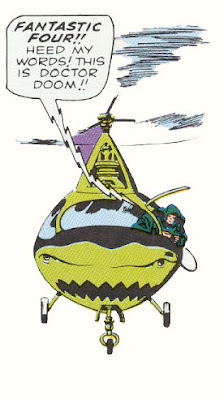 A blog looking at the Marvel Comics of the early 1960s - one comic at a time.